Model 4800 Random Load Billet Feeder can handle billets up to 6” in diameter and lengths up to 30” long. Feedall can provide a hydraulic tub dumper or a motorized 180º roll-over dumper so loading parts is no problem. Our billet feed system can handle a wide variety of part sizes and shapes. There is essentially no part recirculation or fall back with this type of feeder. Feedall can provides a metering hopper that takes all the initial impact of a full dump, increasing the life of the feed system. Handles billets up to 6″ in diameter and lengths up to 30″ long. Loading is no problem with a hydraulic tub dumper spilling billets into a vibratory “metering” hopper, which loads the elevating hopper feeder. This takes all the initial impact of a full dump increasing the life of the feed system. Billets are then oriented and loaded onto a cross-feed conveyor feeding an induction heater. Feed from a random loaded floor mounted hopper. Saw-cut steel billets are elevated from the hopper via cleated belt and deposited in an end-to end orientation to a transfer device. The parts are presented and pushed into an ajax coil, which holds five parts and has a heat cycle of 50 seconds. The parts are then pushed one at a time for operator pick-up. Feed from a random loaded floor mounted hopper. 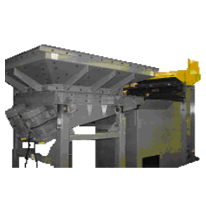 Saw-cut steel billets are elevated from the hopper via cleated belt and deposited onto a cross-feed conveyor. The conveyor translatse the parts in a continuous stream to an existing pinch roll device. Feed from a random loaded floor mounted hopper. The billets are elevated from the hopper via cleated belt and deposited onto a cross-feed conveyor. The conveyor translates the parts in a continuous stream onto a model 1650 conveyor. Feed from a random loaded, floor mounted hopper. The blanks are elevated from the hopper via a cleated belt and discharged sliding in a continuous end-to-end stream in a stub chute to a customer supplied conveyor. Feed from a random loaded floor mounted hydraulic tub dumper. The billets are elevated from the hopper via cleated belt and deposited onto a cross-feed conveyor. The conveyor translates the parts in a continuous stream into a forging press. Feed from a random loaded, floor mounted hopper. Steel billets are dumped from a tub (40” long x 32” wide-dump side x 40” tall) into a urethane lined vibratory metering hopper. Upon a signal these parts are then metered into a vertical elevating hopper feeder (Model 4800) designed specifically to only pick up parts in the proper orientation with no fallback. Once loaded onto the belt the parts are elevated, then swept off the cleats onto a horizontal cross feed conveyor which feeds parts in a continuous end-to-end stream to a vibratory track. Feeds steel billets from a random loaded floor mounted hopper. The billets are elevated from the hopper via cleated belt and deposited onto a cross-feed conveyor. The conveyor translates the parts in a continuous stream onto the customer’s existing conveyor.